An inexpensive tube of Aquaseal will keep you old waders going a few years longer! Have your waders sprung a leak? Don’t throw them away you should be able to fix them yourself. Get a tube of Aquaseal from your tackle dealer or hardware store. Firstly pinpoint where the hole is. Sometimes there can be more than one small leak. There is nothing more annoying than fixing what you thought was just one hole only to discover that wet feeling as soon as you wear them back into the water. Once you have found the leak or leaks mark the waders on the outside with chalk. Turn your waders inside out. Make sure they are completely dry. You can stick a patch on the inside or the outside. Cut a patch from material that is similar to that of your waders. Cut the patch so that it overlaps the hole or tear by about 25mm. Coat both patch and area around rip with Aquaseal. Place the patch over the hole and press out any bubbles. Then leave for 24 hours. It is best to keep the repair level as it dries because the Aquaseal tends to run downhill. Aquaseal will also repair tears and holes in inflatable mattresses, inflatable boats, canvas and trailer electrical connections. You can also use it to coat the join when splicing fly line to backing and so on. 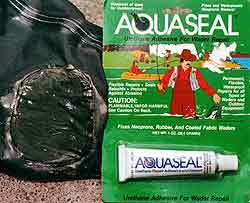 It is possible to repair quite large holes and rips in both neoprene and light-weight waders with Aquaseal. Occasionally you see salmon anglers at the beach or river wearing waders that are covered in patches. It pays to always store your waders by hanging them from a rack up-side-down by the feet. This prevents folds which are potential weak points. It also allows the air to get inside which prevents rot. It goes without saying that you should always hang your waders up to dry as soon as you get home from fishing. A short length of wood passed down inside the leg to the tops of the gumboots keeps the side apart and greatly speeds up drying. Many years ago I was surfcasting on the South Island’s West Coast. I put my waders on at the car and then descended down to the beach along a narrow track. The track was about two hundred meters long through native bush. The area was stunningly beautiful. Native birdsong filled the air as we walked happily along the track which was well on its way to being reclaimed by the rich greenery. We carried plenty of fishing rods and other gear passing under tree branches and through a creek. Stepping up out of the sparkling clear knee-high creek I realised to my horror that both my boots were full of ice cold water! Some of the bushes I had rubbed against along the track obviously had their own thorny protection. Why didn’t I carry my waders down to the beach in my pack? I don’t know! We were on day one of a three-day beach fishing trip and I had no way of repairing them. I haven’t made that mistake again. Light-weight waders are the worst for springing a leak. Neoprene waders are by far the best choice. They might be awfully hot to wear in warm weather but will last much longer and are harder to hole. Don’t throw those old waders away. Patch them up. Even if you don’t wear them one of your kids might find them useful some day. Tight lines.